David: Oh my god, we better hurry, before you know it the Renaissance will be here and we'll all be busy painting.Cheryl: What are you talking about?David: That's a line from a movie. Forget it, it didn't work. It's a Woody Allen movie, does that carry any weight?Cheryl: No, it doesn't. 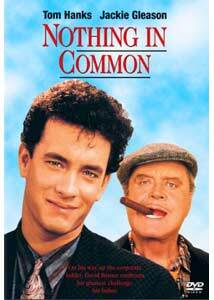 Tom Hanks and comedic legend Jackie Gleason star in Nothing in Common, and the title is likely intended to bring to mind mismatched comedy teams of old. It's a bit surprising, then, when the film's comedic and spirited beginning with Hanks later gives way to poignant family drama, and the story changes tracks. The title may illustrate the relationship between the Hanks and Gleason characters, yes, but it's also a pretty apt description of the film as a whole�two separate movies with nothing in common.The first movie is a lighthearted romantic comedy set at an advertising agency, with Hanks showing off his soon-to-be-superstar talent as David Basner, an ambitious, young executive who has invigorated the company with his creative campaigns (for some reason, commercials in movies always play like parodies of commercials, all high concept and emotion, and totally unlike anything actually shown on TV). And though he has luck with the firm, gaining a promotion and a window office, David is unlucky in love, unable to stay with any one woman for more than a few weeks. This section is pretty lightweight, but Hanks carries it with charm to spare, wooing business associate Cheryl (Ward), but still pining for his high school girlfriend (Armstrong). The dialogue is peppy, and Hanks shows off his comedic skills, honed in sitcoms and teen fare, and does well with a character similar in spirit to the one he would play in Big, two years later. Everything changes for David (and for us) with a call from his father Max (Gleason). His parents are divorcing after a lifetime together. David, already rocky when it comes to relationships, doesn't deal well with the split, nor with being the go-between, negotiating and running errands for his parents. As the latter half of the film wears on, the comedy slips more and more by the wayside in favor of a much more affecting, and certainly more compelling, portrait of the rocky relationship between father and son. I'm reminded of Postcards from the Edge�that was a comedy/drama about the bond between a mother and daughter. This is a less successful hybrid, with a much heavier tone in the latter half, but the emotions are similar throughout. It is difficult for children when their parents, people they may have little to do with in their later years, all of a sudden need them once again. Max says of his son, "You were the last person I ever expected to come through for me," and David probably could've said the same. The somber conclusion forces him to reevaluate their relationship, and discover just why it is that he barely knows his own father after 30 years.Gleason, looking for all the world like a Godfather-era Brando, gives a fine performance in a difficult role, his last. Max is a bitter, unlikable man, often cold and certainly distant, and director Garry Marshall is careful to never sentimentalize him or soften his edges. Eva Marie Saint plays David's mother, and adds some emotional weight to a somewhat bizarre and flighty role.Nothing in Common feels like two movies cut in half and pasted together, and while I found the second one more heartfelt and thought provoking, the first isn't bad either. They both kept me entertained, anyway, so I guess they at least have that in common. Image Transfer Review: Both an open matte and a 1.85:1 presentation are offered on the same side of a dual layered disc. The presentation is good, and certainly equal to most of Columbia TriStar's catalog product. Colors look very natural, and blacks are deep while not so much that shadow detail is sacrificed. The overall image is somewhat soft with a hair of visible grain, the this simply results in a nice, film-like appearance. Despite the inclusion of so much video on one side of a disc, compression artifacts are never a problem (nor is edge enhancement), but the frequent shots of the Chicago skyline showed some aliasing on my display. Audio Transfer Review: As mono tracks go, this one is only fair, owing mostly to some problems with the dialogue track. Fidelity, there, is limited, making it sound disconnected and unnatural at times (though it is always clear and well integrated in the mix). The score and pop soundtrack sounds a bit better supported, with decent dynamic range. Sound effects are sparse throughout, but sound ok when they do pop up. While the disc probably would've benefited from a more expansive stereo remix, the mono sounds fine for what it is. Extras Review: Extras are limited to the trailer and Columbia's typically impressive multi-language support. A Garry Marshall commentary would've been nice, as I found him very personable on the tracks for Pretty Woman and Runaway Bride, but it isn't a major loss. Though it feels a bit schizophrenic, breaking cleanly in half into equal parts drama and comedy, Nothing in Common, as a whole, is still quite entertaining. Garry Marshall has excellent commercial sensibilities, and he's usually able to keep control of the schmaltz factor. While the pairing of Hanks and Gleason doesn't produce the fiery comedic sparks you'd expect, the two really carry the film in its dramatic moments, tying the disparate threads of tone and storyline into one enjoyable whole.